Sales and marketing should be BFFs. We might have different focuses and methodology, but the goal is the same for both departments: make sales and drive revenue. Too often, though, the relationship is more like a mismatched buddy cop movie than a rom-com. You decide which one is the old cop a week from retirement, and which is the young maverick who plays by his own rules. It’s high time for our buddy cops to stop squabbling and work together. 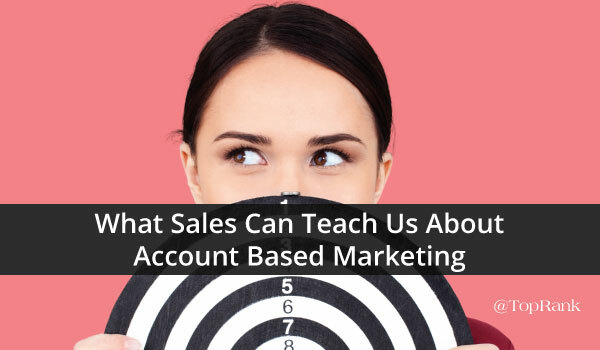 There’s an up-and-coming trend in B2B marketing that presents a perfect opportunity to learn more about sales and borrow their tactics for success: account based marketing. Account based marketing (ABM) means using highly-targeted content to nurture your ideal audience. As the name implies, it focuses marketing down to the level of key accounts, or even individuals within those accounts. Rather than blast an e-mail and celebrate a 2% open rate, ABM hits the most valuable audience with pinpoint-relevant messaging. ABM is not a new tactic, but it’s increasing in popularity as technology makes it easier to both target more accurately and do it at scale. In a recent survey, 80% of marketers measuring ROI said ABM performed better than their other marketing investments. A Demandbase report found that in organizations using ABM for at least a year, 60% saw at least a 10% increase in revenue, while the top 19% saw a 30% increase. Simply put, ABM is catching on, and early adopters are seeing substantial results. Yet many marketers struggle to get started, because the central idea of ABM runs counter to what we’re currently doing. Best-in-class salespeople are a fantastic resource for ABM best practices. In their new report, The State of Sales in 2016, LinkedIn collected insights into what tactics are working for top sales performers. They found that the most indispensable sales tactic, social selling, looks a lot like marketing. Basically, social selling involves developing relationships with prospective clients before pursuing sales goals. Social sellers use social media—LinkedIn, Facebook, and Twitter—to identify and engage with buyers. They leverage the intelligence gathered on social sites to share timely, insightful content. The goal is to establish the salesperson’s value before asking for an appointment or making a pitch. Social selling is delivering valuable content to the right person at the right time. Sound familiar? Ironically, salespeople were initially wary of social selling because it seemed too much like marketing. But now that it’s proven effective for sales, with 90% of top salespeople using the tactic, marketers can borrow from social selling for account based marketing. It’s the circle of revenue, and it moves us all. The main difference between social selling and marketing is that social selling focuses on key accounts. We talk about building a community as marketers, but social selling works at a far more granular level. It’s worth seeing what tools your sales department uses for social selling—how they identify prospects, follow their digital footprint, and identify trigger moments to engage with content. As marketers, we’re used to working on more of a macro level. We target based on personas, aiming for the audience that contains the few who will become leads, producing content that invites a value exchange. Meanwhile, sales operates on the micro level. They focus on cultivating individual relationships. Account based marketing works best when it’s a fusion of great content and strategy from marketing, and account-handling knowhow from sales. It’s a shift from one big funnel to represent an abstract buyer’s journey, to many mini funnels, one for each account, each with content to nurture buyers through the journey. So if your departments are bickering like buddy cops, it’s worth doing a ride-along to see what you can learn from the other side. You may never see 100% eye-to-eye, but you can work together more closely to get results. How do you view account based marketing? Is your organization rocking it, looking into it, or not interested? We are just now looking closely at ABM and selling. The concept itself is extremely interesting to me, as I always felt that going for quantity over quality does not have much future in a long term.